It’s Week Two of The One Room Challenge! Now that we have established the before situation, we are getting down to business in the sunroom. This week has been all about finalizing plans and installing a new floor. If you are coming from ORC and new to KS Design Company, welcome! We are a mother-daughter design team working in Topeka and the Kansas City metro. We started KS Design Company last summer and completed our first One Room Challenge last fall. The mood board is complete! Luckily, my husband, Lance is really good about going with the flow when I make design choices in our house. He will give his opinion on major items (more about that later! ), but otherwise he says I’m the creative one in the marriage and let’s me plot out the details. Since we are definitely laid back, non-formal people, I wanted a casual and relaxing vibe for the sunroom. I think Kylie and I achieved that with this design plan. It’s light and airy layered with natural elements such as slate, wood, cane, and plants. (Fingers crossed that I can keep the plants alive! No green in my thumb!!) Since the sunroom is off of the great room, I wanted to keep the color palette similar but with less saturated tones, focusing on shades of blue, green, peach, and pink. The focal point of the room will be a daybed with bookcases on either side to give it a seamless look. I couldn’t find bookcases in the exact width I needed, so Lance graciously agreed to build them. The big question: Stain the bookcases or paint them white? Any thoughts? 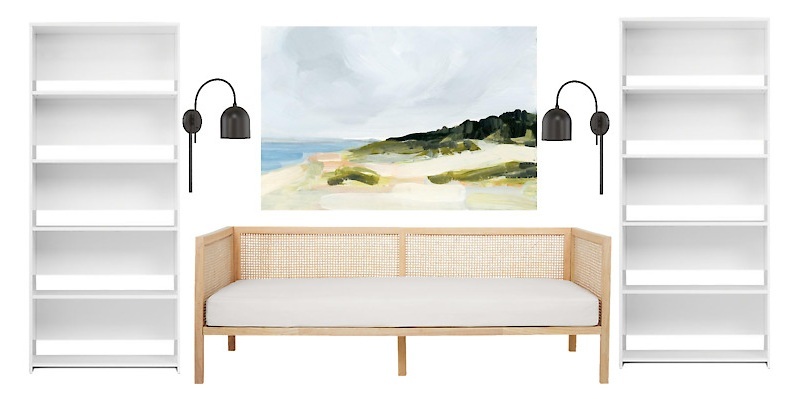 We will install a large art print above the daybed and use two wall sconces to help add light at night. We plan on adding a bistro table for playing games, doing puzzles, or just having a cup of tea. We have a base from an old table, and I am in the process of looking for a top. This is proving to be a little more difficult and costly than expected (Plan B might be making an entrance!). Two stools will flank the table to keep the footprint small. A wall sconce that can extend out over the table will round out this corner. Got to be able to see those puzzle pieces! The finishing touches of the room will include a little glitz in the overhead lighting, some smaller pieces of wall art, plants, containers for storage, and pillows for the daybed. Gosh, I better get started! The journey to the floor involved quite a bit of leg work and decision fatigue, but I will spoil the ending: the floor is in, and I love it! Short story: I thought I wanted brick. We went with black slate. Long story: I had saved numerous inspiration pictures with beautiful brick floors (think Parisian chic). Remember when I said Lance does occasionally chime in on big decisions? Well…he wasn’t sold on brick. He thought it would be rough to walk on and hard to clean. Valid points, I had to agree. My next choice was black slate. Still very organic and has a lot of texture. I had my heart set on a small scale herringbone pattern (similar to what I would have had with the brick floors), which required 3x8 tile. So the hunt began. I found the size I needed at a big box store, but could it be that easy? Nope, no, of course not…Each store location had very limited quantities. Thus, I traveled to three cities buying out all the tile each location had. And I had a border of larger tile installed because there still weren’t enough 3x8 tiles—and I wasn’t going to a fourth city. It ended up being worth it. Nick, our tile installer, worked his magic and the floors are amazing! If you are in the Topeka area, we highly recommend Tile Worx by Nick! The to-do list. Italics=partially completed. That’s quite a list. Good thing we love this stuff!! Thank you for stopping by! Next week we will (hopefully) be saying goodbye to the robin egg blue paint. In the meantime, take a look at the 20 featured designers and other guest participants.